Save Your Back, Save Your Knees, Save on What You Grow in These! 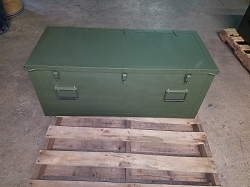 Mechanics 18 gauge steel tool chest with removable 4" deep tray. 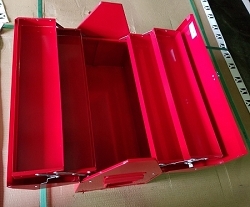 Powder-coated red finish with a pad-lockable hasp to secure your tools. 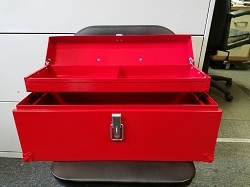 Store your tools in a heavy-duty, long-lasting tool chest that is made in the USA. IF YOU ARE ORDERING MULTIPLE BOXES AND WANT TO USE YOUR OUR FREIGHT COMPANY, PLEASE CALL 814 665-2628 WITH YOUR ORDER. To place an order, you can order either online or call (814) 665-2628. All shipping is via FedEx when entering "ship to" addresses for government orders, please make sure FedEx can deliver there, NO APO addresses, lower 48 States only. Copyright Aaron's Homestead Products. All Rights Reserved. eCommerce Software by 3dcart.